Are those Crossroads IEMs? I have them and I love them. I saw the TAL show a while back and have been meaning to contact you. I thought the show was insightful and well done. Leave it to Ira Glass to discover your interesting story! I was completely impressed by you. I’m sure you hear that a lot. I want to get right to my point, because I would love to help you express more of yourself to the world, if possible. I noticed that you were not using a Passy-Muir Valve. This valve can give you the ability to communicate while being ventilated for as long as like, depending on your condition. We have many people who use the valve all day, every day. It can also improve your swallow and decrease secretions and thus your need for suctioning. I am not trying to make a sale here. I am the president of the company and I know the difference the valve can make for people who are trached/vent dependent. I am not a clinician but from what I saw on the show, you seem like an ideal candidate. I was particularly touched by the scene where you went off the vent so that you could speak briefly to your girlfriend, with what seemed to be great difficulty. The fact that you were willing to endure what looked like significant discomfort for the opportunity to express yourself with you own voice, speaks to the fundamental importance of an individual’s ability to communicate. If you are interested, go to our website passy-muir.com. You can watch a video that explains how the valve works and read about the benefits. Also, you can learn about David Muir, the inventor of the Valve. 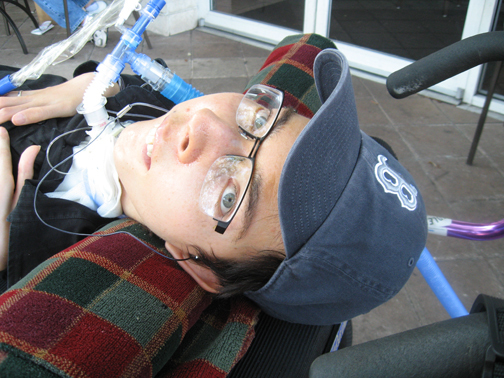 He was a quadriplegic with muscular dystrophy who developed the valve for his own use. He was a remarkable man with a spirit and drive not unlike yours. If after reviewing the info, you are interested in talking to a clinician or trying a valve, feel free to contact me. Otherwise, keep up the blogging and dishing out your humor and inspiration to the world. There is a shortage of perspective out there and your thoughts and insights are a welcome gift. Good luck to you. I will continue to check your blog to see what interesting things you are up to and thinking about.